Romance Around the Corner: Hale No, RT! You may remember Kathleen Hale from scary actions such as stalking a blogger, going to her home, calling her at work, exposing her, and writing about it on The Guardian. @dearauthor We were not involved in this incident, and we do not disclose our blogger contact information as a general matter. @_Ridley_ We take harassment very seriously, & do not condone such behavior. Also that SoE was given in January, before recent events. @ros_clarke @_Ridley_ @anacoqui Currently she's not registered, nor would she be welcome. The first tweet explains the nomination. The book won the Seal of Excellence back in January, so it received an automatic nomination for Book of the Year. 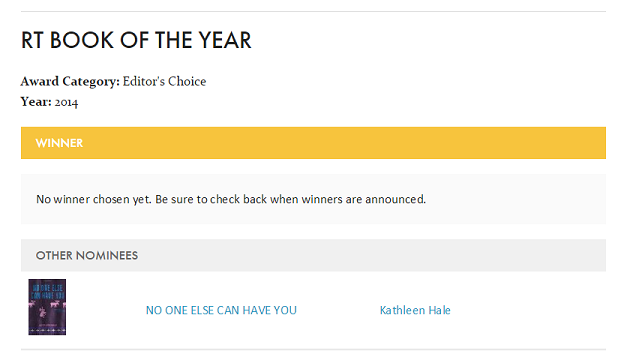 There was nothing they could do about it, I guess, because they either have no control over their own award, or they can’t break or change their rules, not even when they are nominating a stalker to an award whose ceremony takes place in a convention that’s full of readers, bloggers and reviewers, many of which have vocally condemned her actions. The second tweet says that she’s not registered (and I bet someone at RT breathed a sigh of relief for dodging that bullet) and that she wouldn't be welcome. And although I appreciate their good sense, I wonder if that’s all they’ll say about it. A twitter reply to someone is not an ideal public statement, because, among other things, it's limited in how public it actually is. And I don’t know about you, but to me, being nominated to an award looks a lot like an implicit invitation and would make me feel very welcome. Now, I expect nothing from RT. I wrote this post as a public statement of my displeasure. Do I wish RT would have pulled the book from consideration? Sure, but they made their decision and I doubt there’s anything we can do to change it. And frankly, I’m not surprised that Hale keeps being rewarded or that her actions keep being ignored. What I do suggest is that the bloggers and readers who are going to RT 2015 email the organizers and ask they implement a strong anti-harassment policy, and then pray that they enforce it as strictly as they follow their rules for the Book of the Year nominations. ETA: Yesterday a reader emailed RT and this was their response (I’m linking directly to the tweet, but if you can’t read the screen-cap of the email, let me know and I’ll send you a transcript). The email says that they can’t strip Hale’s book of the Seal of Excellence, but that they pulled her nomination from the category. 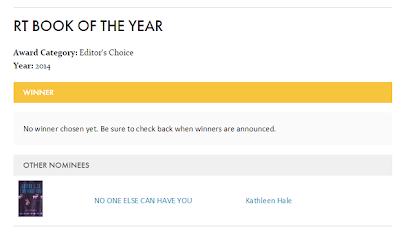 It’s not clear which category they are referring to, because as of right now (November 12th, 2014 12:15 EST) the nomination still appears listed on the website. But maybe it'll take some time to remove it. Here’s the thing, though, two twitter replies and one email do not constitute a public statement. If RT wants me to believe that they are taking this issue seriously, they need to make a public, easily-accessible statement. It would also help if they would try to be more careful with their wording of the issue, because this isn’t an “absurd controversy” and what Hale did is more than just a “bizarre behavior”. So, here I am, waiting. I’ll keep you posted. See ETA 2 on top of the post. Here's the question. If she doesn't win and decides to be offended by it, will she show up at the homes of the people who judged or at the home of the author who did win to see if that author was "up to something"?